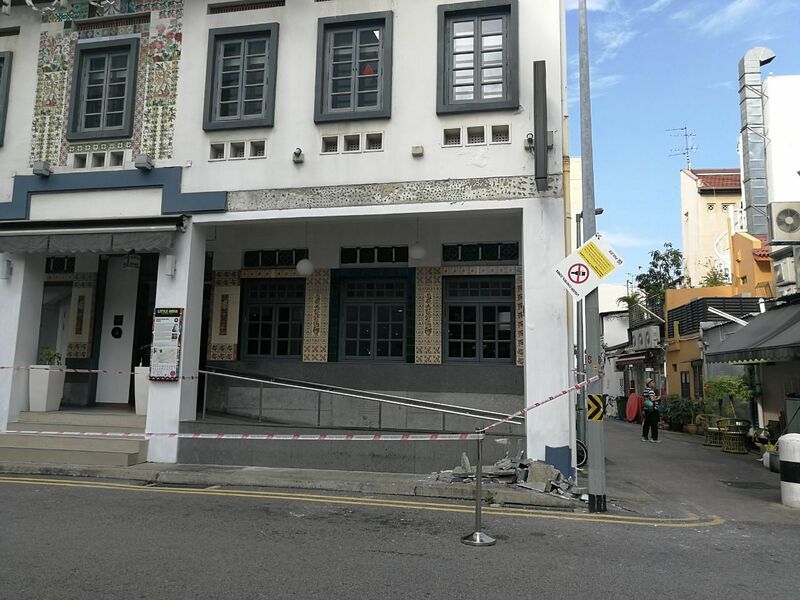 SINGAPORE - A man suffered spinal injuries after he was struck by a falling plaster strip outside a boutique hotel in Little India. The Straits Times understands that the 35-year-old Malaysian was sitting on a ledge next to the walkway outside the Wanderlust Hotel when he was hit on Tuesday night (Nov 27). The Singapore Civil Defence Force said it received a call for medical assistance at the boutique hotel in Dickson Road at 11.40pm. The victim, a cook at ABC Nasi Kandar coffee shop next to the hotel, was taken to Tan Tock Seng Hospital. Videos posted on Facebook show large pieces of plaster on the ground next to the man. From the video, the man appears to be in pain and a group of passers-by can be seen trying to calm him down before the paramedics arrive. 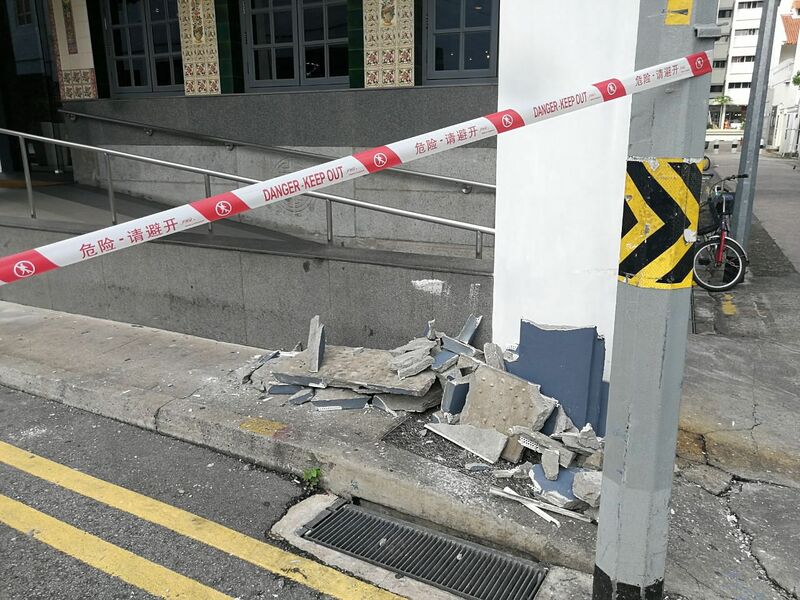 The Building and Construction Authority (BCA) said a strip of architectural feature made of plaster, estimated to be 4m by 0.3m in size, fell off the second floor of the building. “As an immediate precautionary measure, the affected area directly below, where the architectural feature had fallen from the building, and other parts of the building facade with the similar feature have been cordoned off,” said a BCA spokesman. BCA has instructed the building owner to appoint a professional engineer to investigate the cause of the incident. The hotel has also been asked to inspect the condition of the rest of the building facade, and carry out permanent rectification works as recommended by the engineer. When ST visited the scene on Wednesday, an area in front of the hotel was cordoned off. The plaster strip next to a hotel signboard has not been replaced. The victim started working at ABC Nasi Kandar coffee shop next to the hotel just two weeks ago, according to an assistant at the coffee shop. “He was still looking alright when I Ieft work at about 7pm. I hope he is recovering well,” said the assistant, who wanted to be known only as Miss Zhang. Ms Loh Sit Yee, 48, who works at a zi char stall at another coffee shop near the hotel, said she heard a thunderous crash on Tuesday night. “It was a loud boom, like thunder, and gave us all a shock. "We initially thought it was a car accident but we soon realised the man was hit. He was lying there in pain and couldn’t move. It was an awful sight,” she said in Mandarin. Ms Loh said she has seen the man sitting at the same spot on several occasions. “I feel worried about the safety of older buildings, such as this one. I think I will avoid the area near the hotel for now,” she added. Others working in the area said people often take a breather and sit on the ledge outside the hotel - the spot where the man was hit. These include hotel guests and those who work in the area. In response to queries, a Wanderlust Hotel spokesman said on Thursday that hotel guests have been informed about the incident and they have been advised to avoid the cordoned area. The spokesman said that the injured man was discharged from hospital on Wednesday and has returned to Malaysia. He suffered injuries to his thighs. ​The building that houses the hotel was bought by KMC Holdings, a company owned by hotelier and restaurateur Loh Loh Lik Peng, in 2008. It used to be the Hong Wen School, and once housed a kindergarten, educational facility and prayer hall. The renovated hotel opened in 2010 and won an Architectural Heritage Award from the Urban Redevelopment Authority in 2011. In June this year, it was sold to local property investment firm, 8M Real Estate, for $37 million. There have been other cases of decorative structures falling off buildings. In June, a decorative panel fell 40 storeys from the top of a Housing Board block in Bendemeer Road. No one was hurt. Police officers cordoned an area roughly half the size of a basketball court for about 17 hours. Checks on neighbouring blocks with similar facade features were also conducted as a precautionary measure. In the same month, a decorative structure on an HDB block in Pasir Ris fell from a height of at least eight storeys. No one was hurt.